Interested in other items of oak dining furniture? 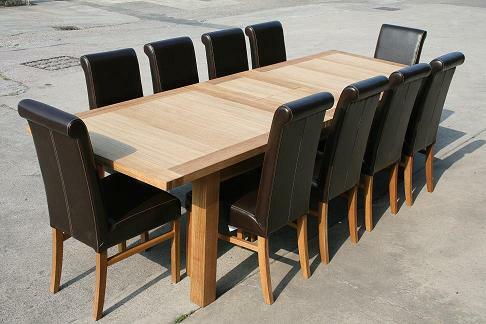 Contact us with your table and chair requirements as we offer a huge selection of solid oak dining table furniture. Looking for oak tables and chairs to furnish a hotel or restaurant in large quantities? Talk to us to get the cheapest internet prices as we order in massive volumes so no order is too big for us to handle and big discounts can be offered. Oak Dining Tables offer top quality large extending oak dining tables with butterfly extensions and dining chairs at highly discounted internet prices. We also offer matching solid oak benches, stools and oak sideboards as well as oak coffee tables, side tables, display units and TV units. We are the UK's leading online oak dining furniture specialists. Search for our oakdiningsets website for more info. A Large Dining Table can be one of the most expensive furniture items that most people ever purchase. This dining furniture website offers top quality oak dining tables, kitchen tables and dining chairs at rock bottom internet prices offering huge savings on high street prices. We offer a wide range of dining table and chair combinations and have recently added I wide selection of additional furniture that matches our dining sets. Some designs come with optional extensions and the Tallinn design has the revolutionary butterfly extension mechanism that hides away in the centre of the table out of view when not in use which many customers really appreciate. 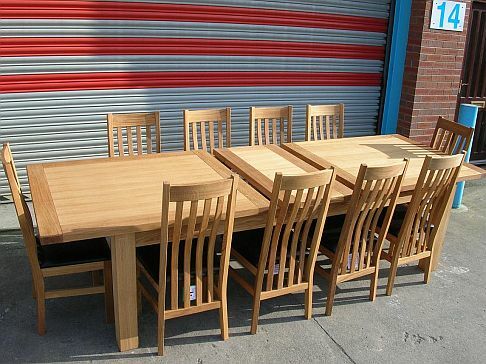 We import all of the oak dining table furniture that we sell in large quantities to enable us to offer you the cheapest internet prices in the UK. Why pay high prices in a high street furniture shop for low quality items when you can buy from one of the UK's largest oak dining table and chair online retailers and save yourself a huge amount of money. Oak Dining chairs at cheap internet prices. Solid oak dining table and oak dining chair sets in Staffordshire, UK. We have focused on oak dining table sets instead of offering many other woods such as Birch, Teak, Ash, Beech, Sheesham, Mahogany, Rubber wood, Walnut or Pine as we feel we have found a great quality product that is extremely popular and the prices are very good value compared to prices you will find in a high street furniture shop. Our furniture warehouse dispatches dining tables, oak dining tables, oak dining furniture, kitchen tables, kitchen furniture, dining furniture, oak benches, solid oak benches, dining sets, oak tables and dining chairs to addresses all over the United Kingdom including Wales and Scotland. We sells large quantities of oak dining furniture every day to a wide selection of customers all across the UK mainland and Northern Ireland and surrounding Scottish Islands. Our most popular oak dining table and dining chair sets are the Tallinn and Riga oak extending butterfly dining tables and the Winchester leather dining chair and Lisa Faux leather dining chair. We import all of our oak tables and dining chairs from one of Europe's largest manufacturers and avoid Chinese products to ensure we offer only the highest quality furniture items.